I seem to be having my share of environmental issues this week. This time its with xcode while trying to upload an update to the app store. The error states ‘This bundle is invalid. Apple is not currently accepting applications built with this version of the SDK, xcode.’ Off to Google I go. There was plenty of help for this issue. Since I had published the app last, I had updated Xcode to 4.2 with support for iOS 5.0. So like commenters recommend (albeit referring to older iOS and Xcode versions), I set my Base SDK to 5.0, rebuild and upload. Same message. ‘This bundle is invalid. Apple is not currently’ yada yada. 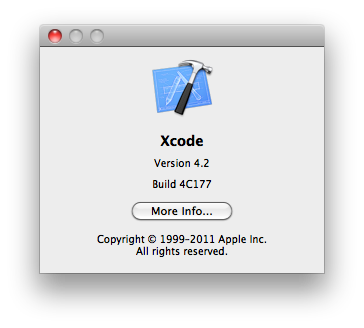 So my Base SDK is updated, and I have Xcode 4.2, and panic sets in. What if my bundle ID has been borked and I can’t deliver the update to my client’s customers? Ahhh different build numbers. So I download the newest Xcode. All of it. Please Apple, give us an update mechanism. 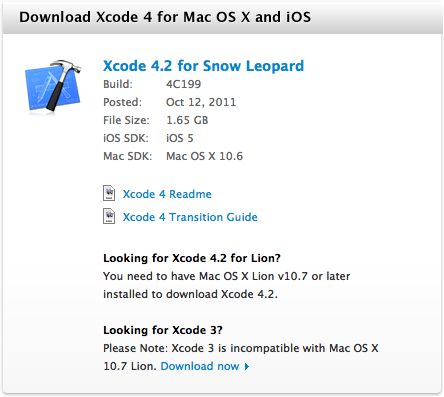 Install the new Xcode, build, upload, enjoy. If you’re receiving the error: ‘This bundle is invalid. Apple is not currently accepting applications built with this version of the SDK, xcode’ check your Base SDK to be sure its the most recent, and check for a newer Xcode build paying attention to the build numbers instead of version number only. Thanks for this, was on my way to the ol’ delete/reinstall, but seeing this proof of my bad version was reassuring before I took on the long process. Thanks Kyle – had the same error and was going mad trying to look for different SDKs. It was just the Xcode version after all!